Objective: Microgravity can influence pathogenic bacteria by changing their various biological characteristics. However, how microgravity affects Streptococcus pneumoniae as well as the relevant mechanisms remain unclear. Methods: A multiple drug resistant Streptococcus pneumoniae strain was cultured in a microgravity or gravity environment for 16 h. Subsequently, various phenotypic assays were performed, including those for morphology, growth curves, biofilm formation and acid and base stress. A combined genomic and transcriptomic analysis was performed. Results: Compared with gravity and the parental strain, the morphology, growth curve and biofilm formation of the microgravity strain did not change, whereas the microgravity strain had increased resistance to weak acid and base solutions and lost the ability to utilize glucuronamide. Comparative genomic and transcriptomic analyses revealed that the microgravity strain had changes in gene expression related to metabolism, cell wall/capsule and cell defense mechanisms. Conclusion: Our study reveals microgravity has a significant influence on metabolism and adaptation in the Streptococcus pneumoniae, which exhibit great flexibility and adaptability to survive successfully via the regulation of multiple physiological functions and cellular pathways. It may provide new understanding of space microbiology. Microgravity is the primary characteristic that distinguishes the environment in space from that on the ground. Bacteria cultured in microgravity can adaptively change their behavior. Although a space mission is an appropriate method to study the effects of microgravity on bacteria, the required expense and technology are limiting in most countries. Alternatively, the rotating wall vessel (RWV) and high-aspect ratio vessels (HARVs) can be used on the ground to simulate low-shear modeled microgravity (LSMMG) . Using this equipment, researchers have reported that microgravity conditions can induce physiological changes in bacteria . These changes include the growth rate, acid stress, osmotic stress and oxidation stress [3-5]. In addition, the virulence, resistance to antibiotics and biofilm formation of some bacteria were increased [6,7]. As space missions have become more frequent, these changes have been considered to be a potential threat to human health, especially to astronauts. During spaceflights, astronauts live in an environment that contains gravitational forces, space radiation, altered nutritional status and anxiety, which are factors that may adversely affect immune system function . Under these conditions, astronauts have a high risk of infections, including opportunistic infections caused by bacterial pathogens, whose proliferation is normally controlled in healthy humans in an environment with gravity . Streptococcus pneumoniae is an important pathogen that can cause infection in individuals of any age. These bacteria colonize the nose and pharynx and can move to the middle ear, blood and lungs when the growth environment changes, which causes bacterial meningitis, septicemia, and otitis media [10,11]. Nearly 1 million people die every year as a consequence of community-acquired pneumonia caused by Streptococcus pneumonia infection . Now a days, drug resistant Streptococcus pneumonia is widely distributed around the world and could be taken to the space with the astronauts. However, it remains unclear how microgravity affects Streptococcus pneumoniae. In this study, we used the RWV to induce low-shear modeled microgravity and then assessed the phenotypic, genomic and transcriptomic changes of Streptococcus pneumoniae that were altered in the LSMMG environment after 16 h.
A Streptococcus pneumoniae strain, belonging to serotype 3, was isolated from the sputum of a patient with pneumonia. Pneumococci were cultured in brain heart infusion broth (BHI; Oxoid, Basingstoke, UK) with 5% sheep blood at 37°C for ~8 h. Cultures were diluted 1:200 into 50 ml of BHI broth and then placed into three 15 ml RWVs, a type of rotating bioreactor designed at the Institute of Biophysics, Chinese Academy of Sciences. Care was taken that each vessel was completely filled with culture medium without any bubbles to create a low-shear environment. All incubations in the RWV were maintained at 37°C with a rotation rate of 30 rpm. The strain incubated for 16 h was named M48, and the strains that were cultured under gravity and the parental strain were named the G and P strains, respectively. Bacterial cells were placed on a copper mesh after being washed with PBS. Then, the copper mesh was fixed with 2.5% (vol/ vol) glutaraldehyde in PBS for 3 h and dehydrated using graded ethanol. Samples were critical-point dried and coated with goldpalladium. A FEI Quanta FEG 205 SEM scanning electron microscope (Portland, Oregon, USA) was used to scan the samples. All experiments were repeated at least three times. A 50 μl aliquot was taken from the RWVs after being cultured for 16 h and was diluted to a concentration of 106 CFU/ml. Then, 10 μl of diluted bacterium solution was added to 96-well microtiter plates. Plates were incubated for 24 h at 37°C, 5% CO2 with 300 μl of fresh Todd–Hewitt broth with 0.2% (wt/vol) yeast (THY broth) per well. The optical density (OD) at 600 nm was measured every 2 h. A blank well with only 300 μl THY broth was also included. A total of three replicates were assayed for each strain. The biofilm formation assay was carried out according to our previously published method . Bacteria were diluted 100-fold in THY broth and were then inoculated into each well of 96-well polystyrene flat-bottom microtiter plates and statically incubated at 37°C with 5% CO2 for 24 h. After washing in PBS to remove unattached cells, Crystal violet (0.1% w/v; Sigma) was added to the wells to stain the attached cells for 30 min at 25°C. Plates were washed with PBS and then left to dry for 10 min; the stained biomass was solubilized in 1% (w/v) SDS. The absorbance of each well was determined at OD 600 nm. All experiments were repeated at least three times. Drug susceptibility testing (DST) for the Streptococcus pneumonia strains was performed using the bioMe’rieux VITEK-2 ASTGN13 system following the manufacturer’s instructions as previously described. The following 18 drugs were tested: penicillin (P), ceftriaxone (CRO), cefotaxime (CTX), cefuroxime (CXM), amoxicillin/clavulanate potassium (AMC), ampicillin (AMP), ampicillin/ sulbactam (SAM), erythromycin (E), azithromycin (AZM), clindamycin (CC), imipenem (IMP), levofloxacin (LVX), linezolid (LZD), meropenem (MEC), moxifloxacin (MXF), tetracycline (TE), trimethoprim-sulfamethoxazole (SXT), and vancomycin (VA). To assess the resistance of Streptococcus pneumoniae strains to acid-base stress, the method previously reported by Cumley et al was used . Strains were washed in PBS (pH 7.4) and then diluted 100-fold into buffers of various pHs and incubated at 37°C for 1 h. Counts were estimated by serial dilution with plating at the end of the incubation period and were compared with the initial number of organisms. Sodium phosphate buffers of speciÃ¯Â¬Âed pH values were generated by mixing 0.2 M NaH2PO4 and 0.2 M Na2HPO4 and were adjusted with HCl when necessary. All experiments were repeated at least three times. A Biolog GENIII MicroPlate was used to analyze Streptococcus pneumoniae strains for 94 phenotypic tests, which included 71 carbon source utilization assays and 23 chemical sensitivity assays. The experimental method was carried out according to the following steps: a 3 mm diameter area of cell was taken from the surface of a BUG+B agar plate (Biolog, CA, USA) using a sterile cotton-tipped swab and was inoculated into IF-A Inoculum (Biolog, CA, USA). The target cell density of the inoculum was set to 90-98% T using a turbidimeter (BioMérieux, Lyon, France). An inoculum of 100 μl was added into each well of a 96 GEN III MicroPlateTM (Biolog, CA, USA) The results were read both automatically and visually using a BIOLOG microplate reader (590 nm) after incubation in an incubator for 24 h and 37°C. Genomic DNA was extracted using a kit provided by Illumina Inc. according to the manufacturer’s instructions; 500 bp libraries were constructed for all three strains. Whole genome sequencing was performed using an Illumina HiSeq 2000 system (Illumina, San Diego, CA, USA) to produce 100 bp paired-end reads. Raw data were trimmed using FastQC  to obtain high quality reads, and then the reads were assembled using SOAP denovo2 . Single nucleotide polymorphisms (SNPs) were detected by comparison with the reference genome of S. pneumoniae JJA (accession number: NC_012466) using SOAP 2.21 , and functional analyses were based on the annotation of strain JJA. Open reading frames (ORFs) were predicted using Glimmer 3 and then annotated by comparison with the NT, NR and COG databases using BLAST with an e-value of 1e-5 . Antibiotic resistance genes were predicted by comparison with the ARDB (Antibiotic Resistance Genes Database) database . Total RNA samples were isolated using an RNeasy Plant Mini Kit (Qiagen, CA, USA). Sequencing was carried out using an Illumina Hiseq 2000 system. Paired-end reads were mapped to the genome sequence of strain M48 using SOAP 2.21 . The number of reads mapped to each gene was counted using a PERL script. RPKM (reads per kb per million reads) values were provided to enable comparisons of the relative transcript abundance among difference samples ; then, mapped count data were normalized and used for differential gene expression analysis with R 3.2.1 . The morphologies of the microgravity strain M48, the gravity strain G and the parental strain P were observed using light and scanning electron microscopy. All three strains were arranged as chains, and there was no difference observed between the microgravity and gravity strains (Figure 1A). This indicated that there was no apparent change in the morphological characteristics of the strain after being cultured in LSMMG. Figure 1: Morphology of three Streptococcus pneumoniae strains. (A) Scanning electron micrographs of the strains. (B) Growth curve of the three strains. (c) Biofilm assays of the three strains. OD600 readings were measured for each strain to determine the amount of biofilm that formed. Data are representative of three independent experiments. The growth curves and biofilm formation of these three strains also showed no significant differences (Figures 1B and 1C). In addition, our findings indicated that these strains had strong biofilm formation ability. The drug susceptibility tests showed that parental strain P was resistant to erythromycin, azithromycin, clindamycin, tetracycline and trimethoprim-sulfamethoxazole, and the drug resistance profiles of strains G and M48 remained unchanged (Supplementary Table 1). Regarding the sensitivity of the acid-base stress assay, our findings indicated that the survival rate was increased in the M48 strain after exposure to pH 6 and 8 sodium phosphate buffers, whereas the P and G strains showed no obvious differences in survival rate after incubation with the buffers with three different pH values (Figure 2). To better understand the metabolic changes in these strains, we also performed carbon source utilization and chemical sensitivity assays using a 96-well Biolog GEN III MicroPlate. We found that the M48 strain lost the ability to utilize glucuronamide compared with the P and M48 stains, whereas the G strain gained the ability to utilize inosine. Both the M48 and G strains became able to use methyl pyruvate compared with the P strain. Among the 23 chemical sensitivity assays, no obvious changes were observed among the three strains. Figure 2: Acid and base stress tolerance of three Streptococcus pneumoniae strains. Strains were incubated with sodium phosphate buffers that varied by pH and were then assayed for survival on plates. Growth is expressed as relative survival after 30 min. The whole genomes of all three strains were sequenced. For the P strain, a total of 286 scaffolds were built with a total length of 2,226,957 bp and a mean GC content of 40.01%. The whole genome sequencing statistics are shown in Table 1. Genome details compared with the reference genome of S. pneumoniae JJA are shown as a circular representation of genome features (Figure 2). Table 1. Statistics of whole genome sequencing. The P strain was used as a reference strain to analyze SNPs. Compared with the P strain, a total of 15 SNPs were found in the G and M48 strains. Among them, 7 were synonymous mutations, and 8 were non-synonymous mutations. All of these SNPs map to 14 genes and the functional annotations are listed in Table 2. Only one SNP differed between strains G and M48, which was located in a hypothetical protein. Figure 3 shows a circular representation of the genome features, including the SNPs, GC skewing, GC content, and COG annotated coding sequences. Figure 3: A circular representation of the genome features. The figure shows SNPs (red, non-synonymous mutation; blue, synonymous mutation), genome scale, genome annotated sequences, GC content and GC skewing. The original read numbers for strains P, G and M48 were 22,837,384; 20,926,330; and 12,115,562, respectively (Table 3). The numbers of total clean reads were 19,320,026; 16,897,612; and 9,985,094 in strains P, G and M48, respectively. The distribution of the number of mapped reads and RPKM values for all three strains are displayed in the supplementary data. The expression levels of all genes and differentially expressed genes identified among the P, G and M48 strains (fold changes>2) are shown in Figures 4 and 5. The P and G strains had similar DEGs, but significantly differed from strain M48. Table 3. Statistics of whole transcriptome sequencing. 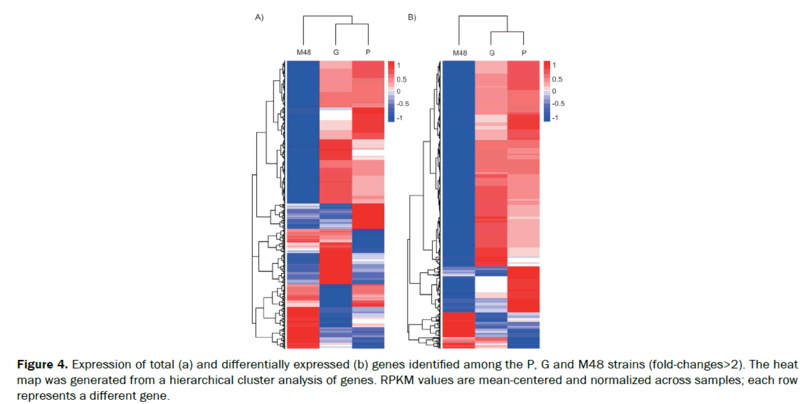 Figure 4: Expression of total (a) and differentially expressed (b) genes identified among the P, G and M48 strains (fold-changes>2). The heat map was generated from a hierarchical cluster analysis of genes. RPKM values are mean-centered and normalized across samples; each row represents a different gene. Figure 5: Distribution of differentially expressed genes among COG functional categories. The y-axis represents the number of genes in each COG category. Based on RPKM, there were 494 differentially expressed genes (DEGs) identified in strain M48 compared with strains P and G. We categorized the DEGs of the strains according to their COG functions (including: strains P vs. M48 and G vs. M48). Compared with strain P, many genes involved in amino acid, carbohydrate and lipid transport and metabolism were differentially expressed in strain M48. The major genes involved in amino acid and carbohydrate transport and metabolism were up-regulated, whereas genes involved in lipid transport and metabolism were down-regulated. In addition, many genes involved in cell wall/ membrane/envelope biogenesis, replication, recombination, repair and ABC-type multidrug transport systems were up-regulated in strain M48 compared with strains P and G.
It is well known that the space environment has an influence on microorganisms . A number of researches have reported that bacteria sent to the space or isolated from the astronauts could have changes in drug resistance, growth curve and stress adaptation [23-25]. Those changes increase the adaptability of bacteria living in the space environment. Thus, the infection disease is still a health threaten to the astronauts. For example, significant number of microbial infection including conjunctivitis and acute respiratory and dental infections occurred just from March 1995 to June 1998 in the Russian space station Mir . Streptococcus pneumoniae is the most common pathogen that causes community acquired pneumonia . Recently, the wide distribution of drug resistance Streptococcus pneumoniae could be taken to the spaceship with the astronauts and affected by the space environments. In this study, we reported phenotype changes of Streptococcus pneumoniae cultured under the LSMMG for 16 h. Using genomic and transcriptomic analysis we found that microgravity environment had an impact on the gene expression related to metabolism and adaptation of the Streptococcus pneumoniae. The morphological study revealed that the microgravity strain M48 maintained the shape observed for the parental strain P and the gravity cultured strain G. Our previous study of Klebsiella pneumoniae after space flight revealed that the strain changed into elongated and adherent forms . Streptococcus pneumoniae has a thicker cell wall compared with the gramnegative Klebsiella pneumoniae and also has a capsule, which causes the cell structure to become more stable. Moreover, we found that microgravity had no effect on the growth curve or biofilm formation. Mutation in antibiotic-related genes is the major reason that Streptococcus pneumoniae has acquired resistance ability. In our present study, compared with ARDB, the parental strain was shown to possess several genes associated with resistance to penicillin, erythromycin, tetracycline and trimethoprim– sulfamethoxazole. However, Streptococcus pneumoniae did not lose resistance to those drugs when grown in a microgravity environment, and the mutant gene also did not change. Many studies have found that the utilization of carbon sources can significantly change in the space environment [27-29]. This occurs because a bacterium in an extreme environment spontaneously regulates their metabolism to increase adaptive abilities. In our present study, the M48 strain lost the ability to utilize glucuronamide. The genome and transcriptome sequences showed that many genes involved in amino acid and carbohydrate transport and metabolism were up-regulated. The study of Allen used HARVs to simulate LSMMG in cultured Streptococcus pneumoniae. A microarray analysis of the RNA also showed that genes involved in cell envelope and metabolism were either up- or down-regulated . After culture in a microgravity environment, the survival of strain M48 was more resistant to the weak acid and base phosphate solutions. A previous study revealed that Salmonella grown under low-shear microgravity conditions showed increased resistance to acid because of changes in the expression of some genes . In our present study, compared with strains P and G, we found that genes involved in cell defense mechanisms were up-regulated, especially genes related to the ABC-type multidrug transport system. The ABC-type multidrug transport system was found to be involved in resistance of Lactococcus lactis to bile acid . Moreover, genes related to the capsular polysaccharide biosynthesis protein in strain M48 were up-regulated. The capsule of Streptococcus pneumoniae could protect the cells from environmental stress. Comparative transcriptomic analysis revealed that gene expression of strains P and G were similar, but were different from strain M48. In addition, although the M48 and the G strain share 14 same SNPs, the M48 strain has another one SNP. The comparative genomic and transcriptomic analyses suggested that the M48 strain experienced more stress under microgravity than the G strain which was cultivated in gravity condition. A large proportion of the differentially expressed genes in strain M48, compared with both strains G and M, were found to be involved in various metabolic pathways, including the following COG categories: amino acid transport and metabolism; carbohydrate transport and metabolism; cell defense and replication; and recombination and repair functions. These findings suggest that in response to environmental stresses, pathogenic bacteria exhibit great flexibility and adaptability to survive successfully via the regulation of multiple physiological functions and cellular pathways. Genomic analysis revealed that the G strain had 14 SNPs according to P strain. And differentially expressed genes involved in carbohydrate transport and metabolism; transcription; translation, ribosomal structure and biogenesis were found between G and P strain. We speculated that the G strain had random mutation and also, had regulated its gene expression when cultured for16 h.
In conclusion, using phenotypic, genomic and transcriptomic analysis to study multiple drug resistance Streptococcus pneumoniae cultured in LSMMG indicated that LSMMG-related stress had a significant influence on metabolism and adaptation in this strain. Our present study may serve as the basis for disease risk assessments and of alternative therapeutic methods aimed at preventing or treating infection during spaceflight missions. This work was supported by the National Basic Research Program of China (973 program) No. 2014CB744400, the National Natural Science Foundation of China No. 81350020 and the National Significant Science Foundation No. 2015ZX09J15102-003. Genome and transcriptome sequences of the three S. pneumoniae strains have been deposited in GenBank under accession numbers SRP062448, SRS1036287 and SRS1036288. Hammond TG, et al. Optimized suspension culture: the rotating-wall vessel. Am J Physiol Renal Physiol 2001; 281: F12-25. Huitema C, et al. Simulated microgravity (SMG) and bacteria. Riv Biol 2002; 95: 497-503. Wilson JW, et al. Low-Shear modeled microgravity alters the Salmonella enterica serovar typhimurium stress response in an RpoS-independent manner. Appl Environ Microbiol 2002; 68: 5408-5416. Kacena MA, et al. Low gravity and inertial effects on the growth of E. coli and B. subtilis in semi-solid media. Aviat Space Environ Med 1997; 68: 1104-1108. Crabbe A, et al. Response of Pseudomonas aeruginosa PAO1 to low shear modelled microgravity involves AlgU regulation. Environ Microbiol 2010; 12: 1545-1564. Chopra V, et al. Alterations in the virulence potential of enteric pathogens and bacterial-host cell interactions under simulated microgravity conditions. J Toxicol Environ Health 2006; 69: 1345-1370. Castro SL, et al. Induction of attachment-independent biofilm formation and repression of Hfq expression by low-fluid-shear culture of Staphylococcus aureus. Appl Environ Microbiol 2011; 77: 6368-6378. Sonnenfeld G, and Shearer WT. Immune function during space flight. Nutrition 2002; 18: 899-903. Horneck G, et al. Space microbiology. Microbiol Mol Biol Rev 2010; 74: 121-156. Leiberman A, et al. Bacteriologic and clinical efficacy of trimethoprim-sulfamethoxazole for treatment of acute otitis media. Pediatr Infect Dis J 2001; 20: 260-264. Kuti BP, et al. Epidemiological, clinical and prognostic profile of childhood acute bacterial meningitis in a resource poor setting. J Neurosci Rural Pract 2015; 6: 549-557. Pletz MW, et al. Advances in the prevention, management, and treatment of community-acquired pneumonia. F1000Res 2016; 5. Li J, et al. Genomic and transcriptomic analysis of NDM-1 Klebsiella pneumoniae in spaceflight reveal mechanisms underlying environmental adaptability. Sci Rep 2014; 4: 6216. Cumley NJ, et al. The CovS/CovR acid response regulator is required for intracellular survival of group B Streptococcus in macrophages. Infect Immun 2012; 80: 1650-1661. Bioinformatics B (2012). FASTQC, a quality control tool for the high throughput sequence data. Luo R, et al. SOAPdenovo2: an empirically improved memory-efficient short-read de novo assembler. Gigascience 2012; 1: 18. Li R, et al. SOAP2: an improved ultrafast tool for short read alignment. Bioinformatics 2009; 25: 1966-1967. Altschul SF, et al. (1990) Basic local alignment search tool. J Mol Biol 1990; 215: 403-410. Liu B, and Pop M. ARDB--Antibiotic Resistance Genes Database. Nucleic Acids Res 2009; 37: D443-447. Mortazavi A, et al. Mapping and quantifying mammalian transcriptomes by RNA-Seq. Nat Methods 2008; 5: 621-628. Ihaka R, and Gentleman R. R: a language for data analysis and graphics. Journal of computational and graphical statistics 1996; 5: 299-314. Horneck G, et al. Life sciences: microorganisms in the space environment. Science 1984; 225: 226-228. Klaus DM, and Howard HN. Antibiotic efficacy and microbial virulence during space flight. Trends Biotechnol 2006; 24: 131-136. Klaus D, et al. Investigation of space flight effects on Escherichia coli and a proposed model of underlying physical mechanisms. Microbiology 1997; 143: 449-455. Kim W, et al. Spaceflight promotes biofilm formation by Pseudomonas aeruginosa. PLoS One 2013; 8: e62437. Ball JR, and Evans CH (2001). "Safe passage: astronaut care for exploration missions.," National Academy Press, Washington, DC. Su L, et al. (2014) Genome Sequence of Bacillus cereus Strain LCT-BC235, Carried by the Shenzhou VIII Spacecraft. Genome Announc 2. Chang D, et al. A multi-omic analysis of an Enterococcus faecium mutant reveals specific genetic mutations and dramatic changes in mRNA and protein expression. BMC Microbiol 2013; 13: 304. Guo Y, et al. (2015) Effects of Space Environment on Genome, Transcriptome, and Proteome of Klebsiella pneumoniae. Arch Med Res. Allen CA (2007). The Effects of Low-Shear Modeled Microgravity on Streptococcus pneumoniae and Adherent-Invasive Escherichia coli The University of Texas. Zaidi AH, et al. The ABC-type multidrug resistance transporter LmrCD is responsible for an extrusion-based mechanism of bile acid resistance in Lactococcus lactis. J Bacteriol 2008; 190: 7357-7366.